I started with a solo I composed today to go over this progression. After I mastered that I began thinking… this chord progression made me feel a certain emotion. It made me vividly remember every thought and every idea that went through my head. I decided to improvise some serious shred. Now that I had these emotions in my head, I had to get them out. a few minutes into this shred, I thought of a three syllable word that truly captured the emotions I felt. The source of these feelings and the cause of relief from them (if that makes sense). I used that three syllable word to create a 3 note motif… not even an original line simple a minor third technique (1st-3rd-1st) on separate strings (zz top’s la grange solo has this along with many more, but that is the most obvious example). Now it is my belief that every practice is a performance so I was very… into it to begin with. every time I hit that motif (always using the chord base and its minor third) I would mouth the word, along with more movement and emotion throughout the song. 2) Every note fits in every key as long as you use it properly.. along those lines, chromatics are wayyy underrated. 3)When TRULY shredding from the heart, you will play music far beyond the compositions of Jani, Petrucci, Yngwie, Satch, or ANY other virtuoso you can think of. This is the most important principle I can tell anyone. 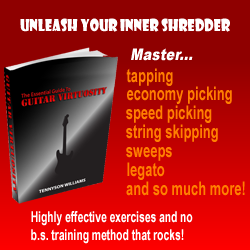 All of these virtuosic guitar players can improvise straight from the heart. Those are usually our favourite solos (If I could Fly took years to perfect, hollow years live solos, any improvising these guitarists do). If they couldn’t, they could never write some of the stuff they do. I usually have trouble nailing certain sweeps such as the glass prison, Yngwie sweeps, and off beat runs. However, with the shredding I just did… I put these runs to shame. I am not saying this with an ego, I am saying that I may have discovered one of the MANY important secrets to shredding. If you can truly access the feelings in your heart and your soul, your body transcends technical skill. It becomes merely a tool of expression and when it does, you no longer have to focus on ability, you don’t even play, you tell your story and your soul plays the guitar. You lose all limitation. Once I had everything I felt out on the guitar, I slowly started to come down from this technical and emotional high and returned to my normal level of playing (which is still pretty f**** good I think ^_^). That’s really my lesson here… play from the heart.. you cant try to do it, it just happens. When something hits you, you can do it just like breathing… it’s as if you are watching someone else play guitar. It’s the most surreal feeling I’ve ever had. I recorded the whole thing on my computer (expecting it to end in 20-30 minutes). If you wish to hear the composition and the before, during and after of this… unbelievably soulful shred…. shoot me a private message or something and I’ll get it to ya as soon as I cut and paste the best parts. It’s 2:23 now. I’ve talked for long enough. If you made it this far, I commend you as I really taught you nothing but simply shared a moment in my life that I learned from. Hopefully, I can attain that state again or make it a permanent thing for myself.